It was December of 1983, I was in 3rd grade and my brother was in 6th grade, and we walked home from the school bus stop as we always did. Upon entering the house we found our parents sitting in the living room and a very pretty Manx cat calmly sitting on one of the chairs with a red ribbon around her neck. If one cat wasn't enough excitement, out of the kitchen came a black streak cruising through the house. It stopped and there was a small cat, also with a red ribbon around her neck, with the look of exploration and curiosity on her face. Amazingly, our parents had gone to the humane society and purchased these two cats for us even though our grandmother, who lived in the same house, was quite opposed to having animals. 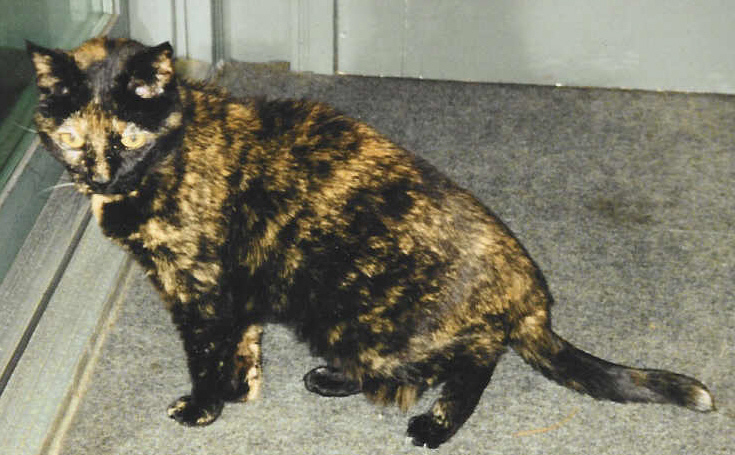 The Manx was a very sweet cat who liked ketchup but would pee in various places throughout the house so we ended up sending her to a farm. No idea what happened to her. The people that owned the little black streak before she went to the humane society had named her "Ashtray". What kind of a name is that for anything other than an ashtray? I considered the name "Motor" for a while as she had quite the loud purr in her youth but ultimately she became simply "Kitty". Kitty tormented my grandmother by always sleeping in her lap and following her around the house. My grandma claimed she hated the animal but would secretly give her treats and then wonder why the cat wouldn't leave her alone. The cat would return the favor by catching and killing small animals, getting them into the house and occasionally leaving them in my grandma's shower. Otherwise, she would leave them at the back door as an offering to us to show how thankful she was... at least I assume that's why she did that. 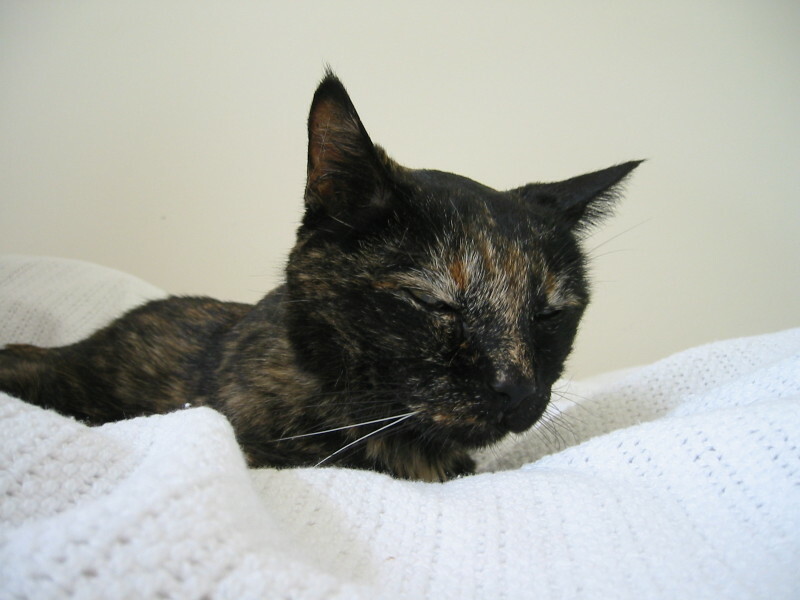 Kitty went to the vet about half a dozen times in her life. Most of those visits occurring in recent years due to the discovery that she was in renal failure after being brought in for an upper respiratory infection. She had to eat special low-protein food for the last 3 years. In recent months her vision had deteriorated, due to high blood pressure, and she would wander around until she found whatever she needed: food, the couch with the heating pad, my dad's lap. 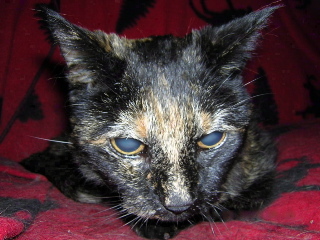 As far as I could tell, she was mostly deaf and her hind legs were very weak. Her coat had lost all of it's shine and she weighed less than 5 lbs. 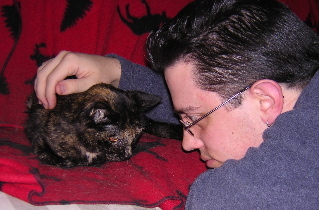 On December 1st, 2003, I brought my oldest friend to the Animal Emergency Clinic in St. Paul for her final visit. I knew she was in pain due to her kidneys and her life consisted of wandering the house bumping into objects and walls until she found her food and then wandering and bumping her way back to her resting place on the couch in the back family room of my parent's house. I didn't want to see her go but I didn't want her to suffer anymore. At approximately 11:15pm, as I held her close and as the doctor was giving the injection, Kitty very gently laid her head on my arm and it was done. The doctor listened briefly to her heart and let me know when it stopped. I brought her into another room in the clinic so we could do a clay paw impression that you bring home to bake so it will harden. I had trouble leaving the clinic as I felt as though I was leaving her behind. I felt and still feel like I'm missing a piece. Many people will think "it's just a cat, get over it" but none of my animals are "just animals". They are like my children and I treat them as family members. My Kitty was almost as old as I am (only 7 years difference) and she will always be my favorite. 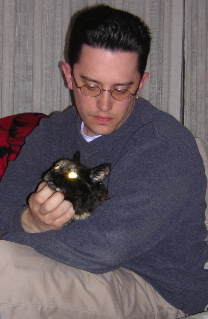 Farewell, Kitty. No more pain.